How to Turn Your Kitchen into the Perfect Entertaining Spot. Love to entertain at home? 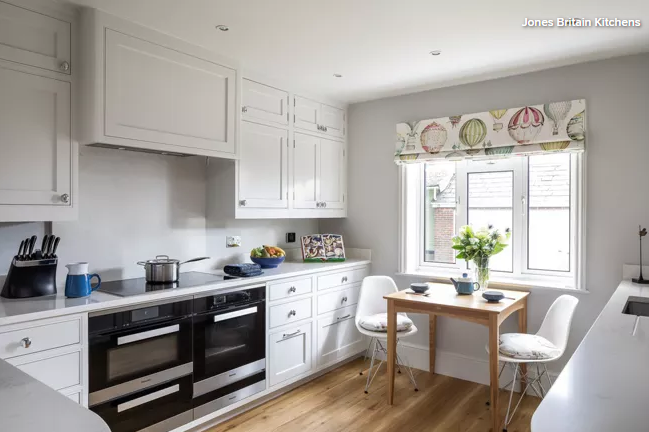 Include these important elements in your kitchen design to ensure guests feel comfortable and relaxed, and to make it easy for you to prepare the space, cook up a feast and clean up afterwards. If your kitchen-diner isn’t huge, but you still want to welcome guests, think about ways to sneak in more seating. A clever trick is to build a banquette, which is more flexible than the usual table and chairs set-up. A bench seat is great for allowing guests to squeeze on, so you can seat more people than you would if you had four chairs around the table. An added bonus of a banquette is that you can fit storage beneath the seats. Ask a carpenter if they can incorporate a lift-up top so you can access the empty space inside. To accommodate guests, your kitchen needs to be uncluttered and as spacious as possible. To achieve this, make sure you have enough storage to keep everything tidied away. Even if your room is cosy and eclectic, you can still include some practical storage. A wooden display cabinet is ideal for storing glasses, cups and tableware, while the open shelves keep cooking equipment out of the way, yet easily accessible. An informal way to get people chatting while you’re preparing food is to incorporate an island or peninsula. It can be a large central area or a small breakfast bar like this. As long as there’s enough worktop space to prop glasses, you’ve got yourself a sociable spot where guests can hover. For added comfort, invest in some bar stools! Avoid overwhelming your guests with cooking odours by ensuring you have a means for fumes to make their way out of the room. A good extractor fan is the obvious solution, and there are lots of models to choose from. If you prefer a more minimal design, look for extractor fans that can be concealed in the ceiling or beneath a wall unit. Alternatively, invest in a pop-up model that can be tucked into the worksurface when not in use. At the planning stage of a new kitchen, it’s a good idea to factor in how much entertaining you’ll actually be doing. If you like to socialise at home often, incorporate that into your kitchen design – particularly when choosing appliances. Opt for the largest fridge-freezer you can afford and can fit into the space. Make room for a dishwasher, and consider installing a double oven. The initial outlay might be more, but if it’s going to work with your lifestyle, it might be worth compromising on other expensive items in order to make entertaining easier. One of the best ways to make guests feel relaxed is with lighting. It’s important to avoid harsh overhead illumination, but at the same time you don’t want the room to feel dingy. A layered lighting scheme is key, with pendants and downlights at ceiling height, over-the-counter LED strips beneath the wall units, and perhaps a few table lamps dotted around. With some careful planning, you can create a space that’s bright enough to see clearly, but with a warm, welcoming feel. For you and your guests to feel relaxed in the space, the last thing you want is to worry about spillages and damage. Consider this when choosing your flooring, cabinet finishes and worksurfaces. Go for materials that are durable and easy to maintain, so you don’t spend your evening anxiously hovering over everyone’s wine glasses. A composite worktop like a quartz one is a good choice, as it’s sturdy, strong and a breeze to clean.